I cast on for a new project this week. That’s not very shocking I know. I’m always doing that. Casting on is a fun time. Its when the project is new and fresh and I’m not sick of the color yet. After an inch or so I get that “oh yes, this is going to work up nicely” moment. All the stitches fit on the needles and the only dangle-y end is from the tail. Yep I like starting new projects and this one is more enjoyable than usual for two reasons. I’ve been meaning to do it for quite a long time. 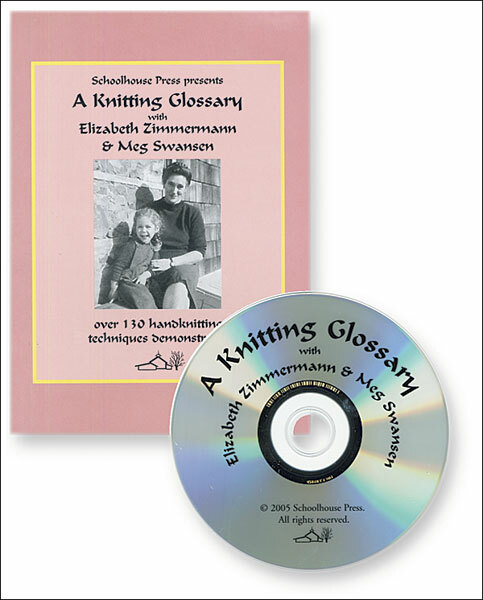 I get to knit it with Ms. Zimmermann. I had a plan to make this particular project ever since I finished handspinning the yarn. 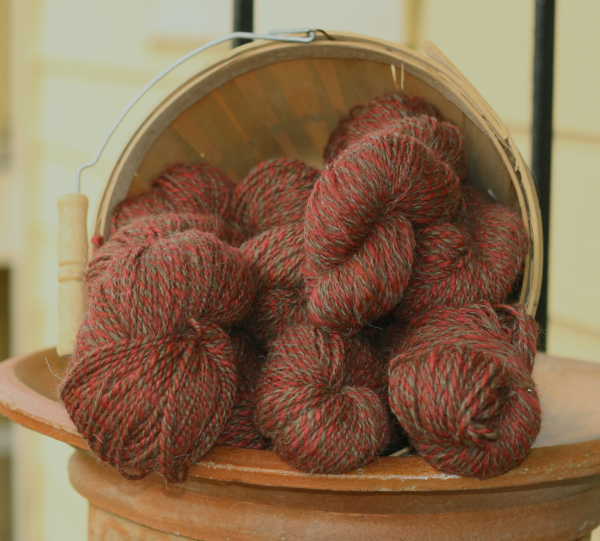 Its the mostly-alpaca brown’n maroon yarn I made for one Spinzilla event. I called it Cherries and Chocolate. Handspun yarn, 75% alpaca 25% corriedale, 2 ply, DK weight. It wants to be a Pie Are Square Shawl. The Pie Are Square design is a modification of the more common Pie Shawl. They are worked flat and have these front panels that drape over your shoulders. Its a shawl that doesn’t fall off. And you can make them big, big, big. The pattern for Pie Are Square is published in Knitting Around. Its not available as a stand alone pattern (as far as I know). But get the book if you can. Its more than another pattern book. Its full of her writing and her personality. In is basic form, these are very simple to make. The body is all knits with yarn overs. 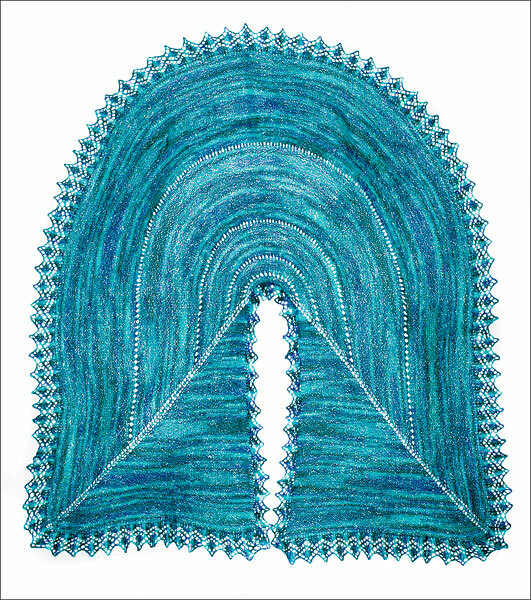 You knit on the shawl until its big enough to suit you. Then you add a knitted on border. Then you’re done. Its a perfect project for handspun or any other time when you have an irregular or unknown yardage. They can be made fancy of course. 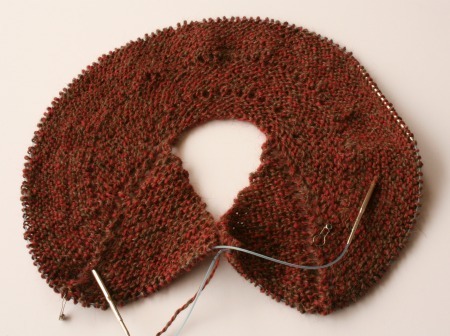 Instead of the knit-back-and-forth garter stitch, they can be made with lace panels and short rows and even color work. But I’m not doing that, not this time. I’m sticking with the simple basic design. 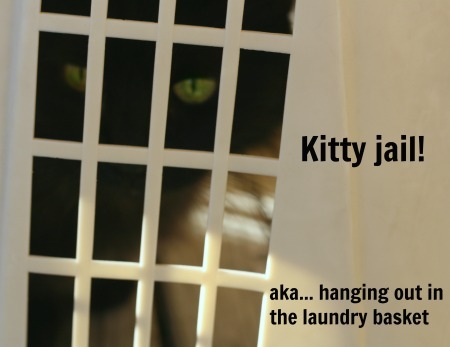 Its what works best for the two-color yarn I’m using. So, yes, I have a no-brainer knit on my needles made from my own handspun yarn and I’m pretty happy with that. But for me it gets even better because this is an Elizabeth Zimmermann pattern. Every time I work on one of her patterns I make it a point to go hang out with Ms. Zimmermann. By that I mean I pull up one of her videos, on any subject at all, and let it play while I knit. She is a natural teacher and so comfortable in front of the camera that I always feel like I’m just sitting in a studio and listening to a boss knitter talk knitting. Plus she is good company. That may sound weird, a video being good company. In fact I know it sounds weird and I never used to admit that I did this. But then I read on one of Franklin Habit’s posts that he did it too. So if its weird, then he and I are weird together (which is very possible because Franklin is a super talented knitter, wickedly witty writer, and more than a bit strange). Ms. Zimmermann is good company. She’s a good teacher too with decades of confidence and a very particular knitting philosophy. Her attitude is that you, the knitter, know what you are doing. 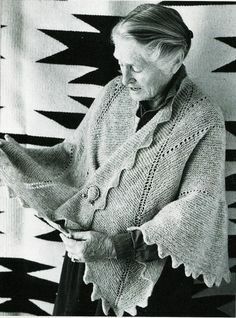 You, the knitter, don’t really need patterns. Or teachers. Or rules. You, the knitter, can do whatever you like. Its very uplifting and her confidence rubs off on me. So I watch her whenever I knit one of her patterns and I get my boost. 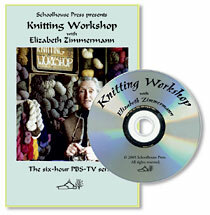 That clip is from disc two of Knitting Workshop DVD. The Workshop is a 6 hour multi-episode series that was filmed for PBS back in the 80’s. It was made to be an accompaniment to her book Knitting Workshop. If your like the scripted, polished productions of knitters smiling brightly into the camera while the gently nudging their knitting around on a table then don’t bother. Ms. Zimmernann doesn’t have a script, she has opinions. She doesn’t artfully display her work, she’s actively making stuff in front of the camera. She didn’t have a big production budget, but she did have a cat wander in to the set and frown disdainfully at all the humans (I think that’s on disc 4). I really enjoy her shows. I admit as a modern American the single camera, down-home filming style is jarring at first. But after a few minutes I don’t even notice. Ms. Zimmermann is a great teacher and that comes through which is all that matters. I could knit and listen to her all day. But I notice that if you head over to the source, Schoolhouse Press, you can purchase streaming versions of these and all the other videos. If you’re one of those who lives out of their mobile device (I’m dragging my feet on that) streaming might be a better choice for you. But do get yourself a copy. Add them to your wishlist. We can all use a teacher like Ms. Zimmermann in our lives. You can find more of me pushing stuff on knitters and crocheters in the big collection of Stuff Jenn Likes posts. 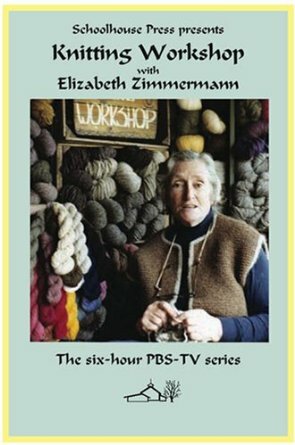 14 Comments on "Knitting with Ms. Zimmermann"
I think I have this on VHS! Thanks for reminding me of it. I’ll have to dig it out & see about moving it to DVD. Happy to be the reminder! VHS to DVD is a pain but I think EZ is worth it. And have a get time re-discovering her. See? 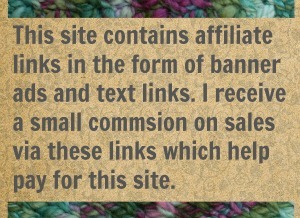 I really didn’t know that other knitters did this. I had to be clued in! I just put the DVD on hold at my local library! Thanks for the suggestion. Good call. I’ve been meaning to write up a post pointing out all the knitting resources public libraries carry. In some towns/system you can find quite a good selection. If I’m TV knitting I try to make it a show that I’ve already seen before because like you, I don’t do much watching. But with Ms. Zimmermann, I follow it all pretty closely. Perhaps because its on knitting, which means more to me than a TV show plot. Or perhaps because its style is very conversational.